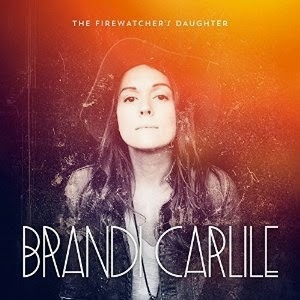 My favorite singer-songwriter Brandi Carlile's newest album, "The Firewatcher's Daughter" has been out for a week, and I've been immersing myself in it to fully absorb and convey its delightful flavor to you. The record's a gutsy, heart-filled mixture of fast and slow, happy and sad, contented and regretful, all bound with a common theme: the importance of resting in love and family, the value in feeling your yesterdays but living your todays. The theme is a natural progression for Carlile and her symbiotic bandmates and co-writers, Tim and Phil Hanseroth, aka "The Twins." They've all started families since their last album, 2012's "Bear Creek." And the maturity and depth they've gained through that experience means they're only getting better musically. And of course, there's the beautiful single the band performed on tour leading up to the album release, "The Eye." What's really special about this one is the shared three-part vocals all the way through. It's practically a capella, so their voices get the chance to really shine. These three just keep getting better the longer they're together. I can't wait to see what they do next.